Life and Wellness Coaches Ross Pelton (a.k.a. The Natural Pharmacist) and Taffy Clarke Pelton have drawn thousands of viewers and media attention for their Buzz Salad creation, a quick and easy recipe that offers nutrition, flavor, and convenience. If you’re on the go and looking for a fast way to prepare an ultra-nutritious salad that will last the rest of the week, then check out the video above, in which Ross outlines the secrets to his popular Buzz Salad. Our lives are so busy, we often don’t leave sufficient time to prepare nutrient-dense, high-fiber meals, but proper nutrition is crucial to maintaining our mental health and balance. Phytonutrients are at the heart of the Buzz Salad—the more colorful your concoction of organic veggies, the more age-fighting, disease-preventing antioxidants you’ll be ingesting. 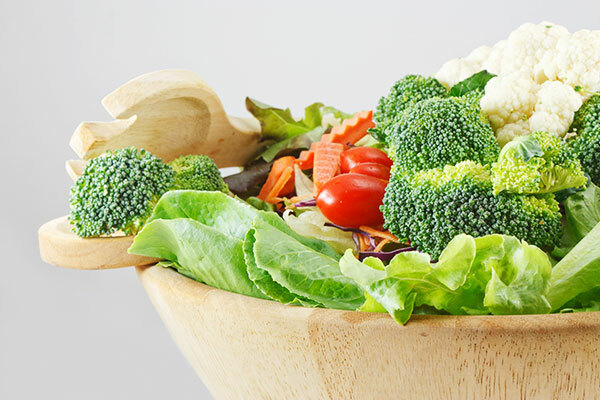 Cruciferous vegetables like broccoli, cauliflower, and cabbage are great choices for the Buzz Salad, as are radishes, carrots, zucchini, and red and green onions. For a touch of sweetness, top with fresh slices of orange, apple, or pear. For some protein punch, you may wish to add nuts, seeds, salmon, or garbanzo beans. Instead of buying prepared dressings, which are often loaded with unhealthy preservatives, you can make your own scrumptious dressings. Get creative—spice up your standard olive oil and Balsamic vinaigrette with some cayenne, mustard, or tamari. Or throw in fresh herbs like cilantro, parsley, rosemary, thyme, or basil. Make your own honey mustard dressing by adding a touch of raw honey. Just have fun and stay focused on nutritious and delicious. By soaking the veggies in a diluted hydrogen peroxide bath, you kill the germs, which will help preserve their freshness. Batch-process the veggies using a food processor, mandoline, or hand chopper. To preserve the prepped veggies for up to a week, place them in an airtight container and sprinkle with lemon juice. Then when you’re ready to chow down, just pull out the container and start assembling your Buzz Salad. Now you’re on your way to a healthier, happier lifestyle. See John Darling’s Medford Mail Tribune article for more details on the Buzz Salad.